Maria de la Paz Bagration-Moukhransky, Princess Bagration-Moukhransky was born on 27 June 1947 at Madrid, SpainG. She is the daughter of Irakli Georgeievich Bagration-Moukhransky, Prince Bagaration-Moukhransky and Dona Maria de las Mercedes de Baviera y de Borbon, Infanta d'España. She married Jose Luis Blanco de Briones in 1968 at Madrid, SpainG. She gained the title of Princess Maria de la Paz Bagration-Moukhransky. Her marriage to Jose Luis Blanco de Briones was annulled in 1977. 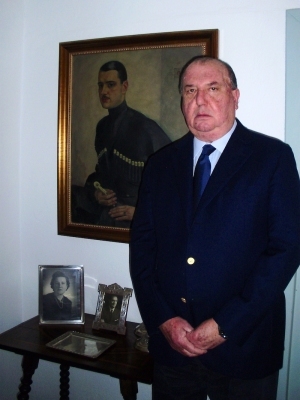 Jose Luis Blanco de Briones married Maria de la Paz Bagration-Moukhransky, Princess Bagration-Moukhransky, daughter of Irakli Georgeievich Bagration-Moukhransky, Prince Bagaration-Moukhransky and Dona Maria de las Mercedes de Baviera y de Borbon, Infanta d'España, in 1968 at Madrid, SpainG. His marriage to Maria de la Paz Bagration-Moukhransky, Princess Bagration-Moukhransky was annulled in 1977. Mercedes Tamara Blanco de Briones was born in October 1969 at Madrid, SpainG. She is the daughter of Jose Luis Blanco de Briones and Maria de la Paz Bagration-Moukhransky, Princess Bagration-Moukhransky. Maria del Pilar de Baviera y de Borbon, Infanta d'España was born on 15 September 1912 at Madrid, SpainG. She was the daughter of Ferdinand Maria Ludwig Franz Prinz von Bayern and Maria Teresa de Borbón y Habsburgo, Infanta de España. She died on 9 May 1918 at age 5 at Madrid, SpainG. She gained the title of Infanta d'España.